The moment of truth had arrived. I was on the plane, headed for Asia. When it was apparent that the plane was nearly empty, I gave up my emergency exit seat and sprawled across five seats in a center row. The plane ride was endless. I remember three full-length movies, and some other programs. We stopped in Hong Kong for an hour, then continued on to Singapore, where I had a three-hour wait until my connecting flight. I think it set in on me there. Loneliness. The blues had hit, and I hadn't even made it to Vietnam yet. Interesting. I had been so busy packing and planning, I hadn't thought about what it would be like leaving my comfortable world to go traveling alone in a very different culture. I flipped through a government brochure on infectious diseases, and awaited my next flight. A few hours later I was finishing the last leg of the journey. With a date line and 15 time zones, my strategy had been to sleep as much as possible. I was wired now. Coming in over the Mekong, the land and water were both the same muddy brown, for as far as the eye could see. Then green appeared. Over the outskirts of Saigon, I spotted patterns of small round ponds scattered across fields -- bomb craters from 30 years ago, I'm guessing. We landed at 3:15 in the afternoon, January 31st -- the Tet. It was 91 degrees. The look and feel of the passenger processing area reminded me of eastern Europe, 11 years ago. There were about 15 visa inspection counters, ten of them open, with long queues from our one plane. Processing was remarkably slow. Then a counter would shut down suddenly and the queue of 20 or 30 would scramble to the back of the remaining lines. New processing counters would open just as randomly, creating another frantic shuffle. I was eating it all up -- I didn't care if I was the last one through -- I was in Vietnam. After the visa processing and Customs. I grabbed my bike box, pannier box, and loose pannier and followed the flow. Seconds later I was outside, surrounded by hundreds of people pressing against barricades. Twenty or more men were scrambling for fares, calling out "Taxi? Taxi?" I headed through the crowd, and followed up with one of the drivers. "How much to Rex Hotel? ", I asked in English. "Seven dollar." (Excellent! Lonely Planet had said something about seven or nine dollars to District 1, so things were under control.) I pointed to the bike box. "OK? ", I asked. "No problem." "Seven Dollar? ", I asked again, pointing to me and the box. "Seven dollar", I was told again. The blues from just a few hours earlier were gone! Things were OK. We walked through the crowd about 100' to the taxi area. We struggled with the bike box. The trunk wasn't going to work, and we couldn't quite close the second back door when the bike box was across the back. I looked around, but the other cabs appeared to be the same model. Finally we figured it out. The front passenger seat was tilted all the way back, and the bike box was slid diagonally from the left rear door to the right front door. I wedged myself into the remaining space, sort of underneath the bike box, and we were off. He drove like a maniac. It was a busy two lane boulevard, and we seemed to spend most of the time in the oncoming lane. His horn was going all the time, and it felt like we were rushing to a hospital or something. The colors, noises, smells -- the chaos -- reminded me of what?... Tijuana. Yeah -- maybe a really big Tijuana... on speed. I was thrilled. We were stopped at a red light. In the oncoming lane of course -- and my driver was refusing to back up so that a turning bus could head up our street. I guess that was the last straw. A whistle blew, a man on the corner in a uniform pointed a white baton, and when the light changed, my driver pulled over, grabbed a paper from his glove compartment, and scurried back to the intersection. A few minutes passed, something changed hands, and the driver returned. He wasn't angry... resigned is a better word. He looked at me, shrugged, smiled, rubbed his fingers together in the universal sign for graft, and said "three dollars." I wasn't unhappy. He was driving more normally now, and I might make it alive to the Rex Hotel. I was staying at the Rex, because it was famous, in the middle of everything, and I had gotten its fax number. Lonely Planet had said that the Tet was a busy time, and accommodations -- both sleeping and travel -- were hard to come by. Sure enough, there had been not one empty seat on the Singapore-Saigon leg of my flight. Somehow the Rex had no record of my reservation, but they did have rooms. I asked for the price of the cheapest room, and was told $88. That was cheaper than I thought I was going to have to pay, so I took it. Tonight I would shop around, and tomorrow, I would move to a hotel more in keeping with the adventure bicyclist image. I was assigned a 5th floor room, and was pleased to see that the hotel staff had no problems with me taking the bike box up there. I showered, visited the Rex's famous rooftop bar -- also on the 5th floor -- then, armed with a photocopy of Lonely Planet's Saigon district map, headed out to explore. I covered a lot of ground. I visited the Continental and Caravelle -- two other famous hotels just a block away, then started shopping price. Over the next few hours I checked out an iffy $27 room, a poor $8 room, lots of $50 rooms, a nice $40 room and a nice $32 room. The room was 3 short blocks from the Rex, and right across the street from the famous Apocalypse Now bar, and I put a deposit down for the following day. I ended my first evening in Vietnam in the Apocalypse, listening to the Stones, Clash, and Pearl Jam, and drinking $1.50 beers, surrounded by a young backpacker set from around the world. Over the next days I did what I could to get ready. The bike was assembled, my new hotel was totally cool about storing the box for a month, and I spent time biking around, checking out the city, and getting used to the heat, traffic, and noise. Robert had said something about not riding in Saigon, but it wasn't really bad. It was a zoo, but bicycles, cyclos (three-wheeled bicycle-taxis) and motorbikes filled the streets, restricting larger vehicles to a reasonable speed. Though it was hot, it was not overbearing -- perhaps because Saigon's humidity doesn't kick in until later in the year. My only warning of things to come was the noise. Everyone loved using their horns. Adding to the chaos, in the late afternoons the promenading began. 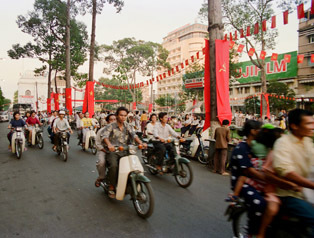 The streets became even more crowded with bicycles and motorbikes. While the bicycles carried only one or two, the motorbikes were carrying two, three or four people. And everyone was dressed up -- celebrating the new year by cruising around and watching others cruise around. 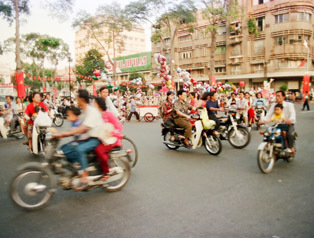 Saigon's major traffic circles are always busy, but chaotic doesn't describe them during these evenings. Each evening I would choose a corner and just stand and watch, amazed that so few collisions took place. 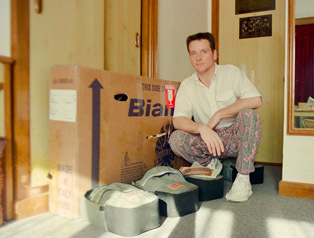 Boxed bicycle and panniers, at the Rex Hotel. 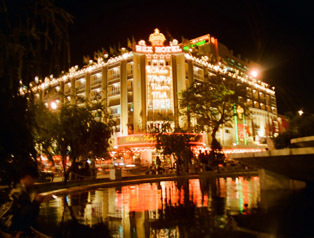 The Rex Hotel at night. 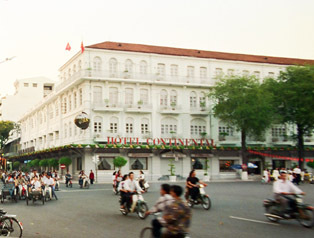 The hotel is famous to a generation of American soldiers who frequented the rooftop bar, and watched "the fireworks" as the Viet Cong probed US defenses at the Ben Hua airbase. Nearby: the Continental - one of the settings in Graham Greene's 1955 book, The Quiet American. 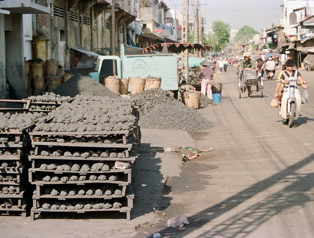 Charcoal balls dry in the sun - just a few blocks off the main boulevards.